This tool generate link to Google Questions and Answers for your listing. Generated links from this tool are not part of Pleper, they point directly to Google. The tool is free to use! Variant 1 : In the autocomplete field start typing your Listing name and select it from the drop down menu. This will automatically add url in Link to maps. But after generate links check that this is your Listing not duplicate or something else. Variant 2 : In "Link to maps" enter url to maps, mapmaker or CID. Variant 3 : Use the Local SEO Bookmarklets. 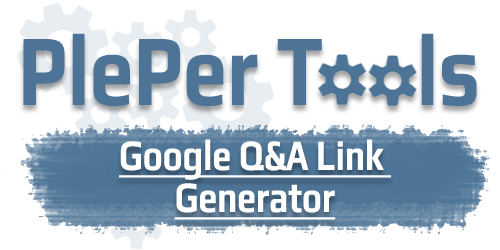 Just drag the above link "Pleper Tools - Generate Q&A Link" to you bookmark toolbar. After that go to your Listing in google maps and click the bookmarklet link, it should open new tab to Pleper with automatically filled information.